Hello everyone! After a quite refreshing break, I am ready to get FCP back into the swing of things. 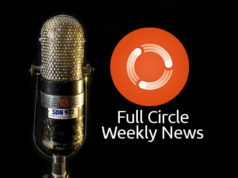 Firstly, on Sunday at 0100UTC, we will be having our Podcast IRC meeting in #fullcirclemagazine on irc.freenode.net. Feel free to use the FCM WebIRC if you aren’t at a real client. It is crucial that anyone who is part of the podcast must attend this meeting. The agenda can be found at https://wiki.ubuntu.com/UbuntuMagazine/FullCirclePodcast/MeetingAgenda. We are also looking for new co-hosts for the show. Please refer to the ad placed in my Sound Bites column in FCM #9 for more details. If you are interested, you must attend the meeting. Also, with some help from Justin Gerace and James Savage, the new Penguin Central Podcast is mostly up and running. You can check it out at http://penguincentral.unixpod.com. The site is syndicated at Planet Ubuntu-Au and the link is at my website.